There’s a mist descending on a small Bavarian village as chaos threatens to impede progress when a traditional secret is lost with the death of its proprietor. This description could be a muddy folk horror born from the soil of Britannia but, against all odds, it is a strangely distant film by German visionary, Werner Herzog. The director seems just as comfortable with mythic tradition, ethnography and geography as he is with fantasy, drama and history. 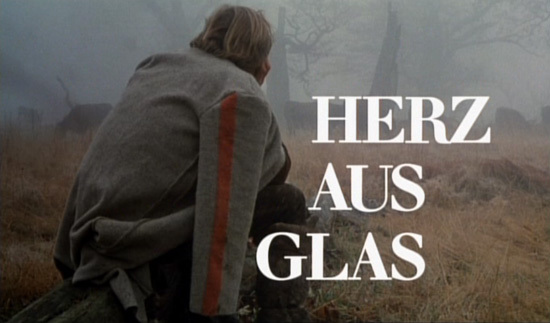 Heart of Glass (1976) is one his most distant films; a gentle but engulfing vision of an isolated community desperate to save their livelihood from dying with its founder. This may appear somewhat vague from the film’s opening few minutes which are more concerned with presenting the dreams of our main protagonist through the geography of the land. A man (Josef Bierbichler) is high up a mountain watching the mist circle and dive before cutting to equally constant phenomena such as waterfalls and rivers. This desire to document the natural surroundings just as much as the characters of his narrative gives the feel of a genuine documentary. A character can’t seem to appear in shot outdoors without the composition involving some of the beautiful surroundings and epic expanses. This is of course a strong aesthetic choice and characters become simple perspective pointers for Herzog’s documenting of the surrounding land. When the story does move indoors, often to grim public house or a glass works, the characters seems oddly portrayed, almost even badly performed. They seem mechanical and aware of something watching them. At first this seems to be the camera causing the characters to feel uneasy yet researching further behind the scenes reveals a popular sound bite that Herzog actually hypnotized most of the cast before filming. This seems entirely plausible for the director who, in past filming, has lived the traumas of his characters and has even pulled a gun on his leading man. He describes hypnotism as “not much different from a form of sleep” which explains away the lack of flinching from his characters as they break glasses of beer over each other’s heads as well as their slow and stylised movements and random speech patterns. Herzog also seems concerned with preserving cultures and dialects like a scholarly ethnographer. Not that the dialogue itself is formally constructed; it again comes from the depths of the hypnotised casts, yet as a filmmaker, Herzog builds strange cultures from genuine history. These cultures seem just as odd as the fantasy cultures that inhabit similar geographies such as Tolkien adaptations and so forth. This is heightened even further to a quasi-religious state by Popul Vuh’s score which involved, according to the director, a brief simply given as to make something that invoked the power of religion and prophecy. Even with the performances stylised in such a way, Heart of Glass still has the feel of real life; a polite invitation to a world left behind. This clash between the highly stylised and the real is typical Herzog and he finds much beauty in the latter while finding chaos and pressure in the former. Of his films, whether fictional or documentary, man always seems to be the touch light for the chaos or for the strain. Though Heart of Glass doesn’t rely on this system as much as Aguirre: Wrath of God or Fitzcarraldo, he presents it in a more subtle way by showing the simple beauty of the landscape juxtaposed to the raw and primitive communities desperate for a simple secret; the ingredients to make a ruby coloured glass. It seems fitting for the community to have at its heart an industry of glass. The title of the film is perfect summation of the characters and the society they’re part of. Whether this is because of the portrayal of the hypnotized cast is debatable but within the film, Herzog has created something that lies in the realm of uncertainty as to its role of a fiction. Avant Godard – Part 3 (Pierrot Le Fou and Conclusion on Godard’s Music).